HONOLULU — State Sen. David Ige announced July 9 that he will challenge Gov. Neil Abercrombie in the Democratic primary next year. The primary, which may include additional challengers, will be held on Aug. 9, 2014 and the winner will face off with the Republican nominee on Nov. 4. “After 28 years serving of serving in our State Legislature, I am running for governor of the State of Hawaii,” Ige, 56, said in a statement. “Our state is at a crossroads, and it is time for real and enduring solutions to ensure that we create opportunities for our children and future generations. We need to strengthen and diversify our economy, improve education, and re-engineer government to better serve the people. “We welcome Sen. David Ige into the race for governor. He has had a long career as a state senator for the Leeward District of Oahu. Voters will have an opportunity to hear and evaluate both candidates’ respective legislative and executive experiences, track records and philosophies. Elections are all about choices. That is the democratic process, and voters will have a chance to engage with the candidates on critical issues that face all of us. Ige was born and raised in Pearl City and is the fifth of six sons of Tokio and Tsurue Ige. During World War II, Tokio served in the 100th Infantry Battalion/442nd Regimental Combat Team and was awarded a Purple Heart and Bronze Star. After the war, Tokio worked as a steelworker on construction projects while Tsurue worked as a nurse and dental assistant. Tokio passed away in 2005 at the age of 86. Now retired, Tsurue resides in Pearl City. A product of public schools, Ige attended Pearl City Elementary, Highlands Intermediate, and Pearl City High School, where he was elected student body vice president and senior class president, was named Scholar-Athlete of the Year, and graduated fifth in his class of more than 500 students in 1975. 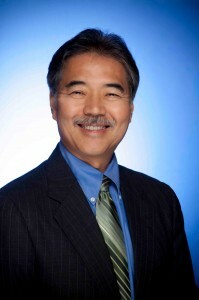 Ige attended the University of Hawaii at Manoa and graduated in 1979 with a bachelor’s degree in electrical engineering. While working full-time, he attended UH College of Business and graduated with an MBA in decision sciences in 1985. His professional experience includes working as an electronics engineer/analyst for Pacific Analysis Corporation; senior administrator for General Telephone and Electronics Hawaiian Telephone from 1981 to 1999; project manager for Pihana Pacific LLC from 1999 to 2001; vice president of engineering for Net Enterprise Inc. from 2001 to 2002; and project manager for R.A. Ige and Associates Inc. since 2003. As public official, Ige served in the Hawaii House of Representatives from 1986 to 1993 and was first elected to the Hawaii Senate in 1994. He is currently State Senate technology leader and chair of the Ways and Means Committee. His other committee assignments have included Commerce and Consumer Protection; Economic Development and Technology; and Health. Among his most recent awards, the National Association of Chief Information Officers honored Ige with the State Technology Innovator Award in 2010 for his leadership in the State Senate’s Paperless Initiative. In 2011, he was named Outstanding Legislator of the Year by the Hawaii AARP and Senator of the Year by the Healthcare Association of Hawaii. In 2009-2010, he received the Advocacy Award from the American Heart Association Hawaii Chapter. Ige lives in Aiea with his wife, Dawn, and his three children, Lauren, Amy, and Matthew.